A boat is not complete without a boat ladder, and choosing the right boat ladder is essential to getting you and your guests back on board after hours of play in the water. There are several different types of boarding ladders for boats available, including Dive Ladders, Swim Platform Ladders, Dock Ladders, and more. The kind of boat boarding ladder you need depends on your boat, the type of water activities you're into, and where you physically want to board the boat. For instance, if one of your primary activities while boating is swimming, then a specialized platform and boat swim ladder for sale is the best option for you. If you're a diver, there are specific dive ladders that support extra weight, accommodate scuba gear, and come with a unique step design for finned feet. Whatever your boating lifestyle looks like, there's a ladder to match and we've got it! Choose from our wide selection of boat ladders for sale and make boarding quick, easy, and safe all summer long. What To Do When Replacing an Existing Ladder? 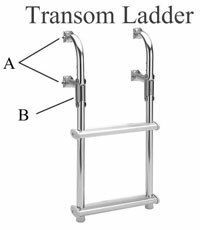 Transom ladders permanently mount to your boat’s transom and are ideal for boats that don't already have a swim platform. Consider installing a backing plate for added strength. Mounting brackets allow for easy mounting while the horizontal tubes can be cut to fit your transom, whether curved or flat. Hinges allow you to flip or fold the ladder out of the water when not in use. This allows for dry storage and, as a result, less overall wear and tear. Dive ladders attach to your boat’s transom via a mounting bracket and deploy at an angle to assist in climbing. 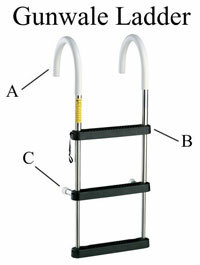 Dive ladders also offer extra weight capacity to account for diving gear. Consider adding a backing plate, as all of the stress is at the single mounting bracket. Wide steps allow for easy climbing with fins. A single middle pipe, instead of two end pipes, also make climbing with fins and scuba gear easier and safer. Dock ladders mount to a dock or seawall. Depending on the model, dock ladders can either be permanently mounted or removable. Hand rails provide a firm grip as you climb those last few steps. Several models come with hinges or other mechanisms to lift the ladder out of the water and help reduce corrosion. Several models have rungs at a slight angle for easier climbing. Gunwale boat ladders hook over your boat’s gunwale. Most models are lightweight and easy to deploy. Padded hooks fit over the gunwale, just make sure the hook diameter is wider than your gunwale. Note, some hooks fold flat. Many models also feature telescoping legs for compact stowage. Look for models with standoffs that push the ladder away from the hull, protecting it from damage and adding stability to the climb. If your boat has a swim platform, special ladders are available to make reboarding at the platform easy. 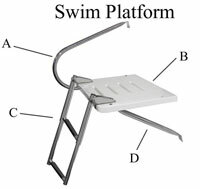 Swim platform ladders can attach either to the top or bottom of the platform. The ladder shown here attaches to the underside. Telescoping steps provide compact stowage. On bottom-mounted ladders they slide underneath the platform, while on top-mounted ladders they flip up and stow on top of the platform. Swim platforms attach to your boat’s transom and provide a convenient means of reboarding after swimming. A handrail makes climbing the ladder easier and provides another mounting point for the platform. Poly platforms come with pre-drilled pilot holes that may require additional drilling during assembly. 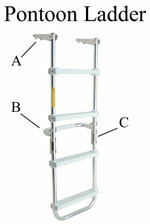 Telescoping ladders either mount on top or bottom of the platform and stow in the same method (top or bottom). Underside support brackets add stability. Designed specifically for pontoon boats, several different pontoon ladders are available that mount at the side gate or under the deck. Gudgeons or hooks provide permanent or temporary mounting to the deck. A single full-width standoff or a pair of standoffs come with side-	mounted ladders to rest against the pontoon and provide stability while climbing. 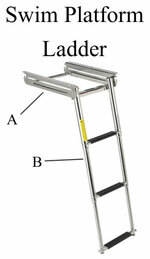 Permanently-mounted ladders feature hinges or sliding mechanisms to remove the bottom rungs from the water. When you're floating in the water, only your head and shoulders are above the surface. This is an important consideration when using a ladder to reboard your boat. If the ladder doesn't extend deep enough into the water, you may have to bring your leg up to your chest just to get on that first rung. As a result, it is very important to choose a ladder that will extend two or three rungs below the water’s surface (about 2 - 3 feet). To determine the overall height of the ladder you need, measure the height of the freeboard on your boat and then add an extra 2 to 3 feet for ladder submersion. For mounted ladders, also take into consideration where the ladder will be mounted on your boat. You’ll need to allow for proper ladder submersion, while also mounting high enough up the freeboard in order to make reboarding easy. Pro Tip: If reboarding from the side of your boat, choose a ladder with standoffs that rest against the hull. This adds rigidity and stability to the boat ladder. Ladders without standoffs in a side-boarding situation can flex and float underneath the boat, making them difficult to climb. Boat ladders come in many different shapes, sizes, and styles. Just as there are hundreds of types of boats, there are hundreds of kinds of boat ladders. As a result, permanently mounting a ladder to your boat is different in every situation. There are, however, a few generalized guidelines to consider, regardless of your ladder mounting situation. Consider having the ladder professionally installed. Having your ladder professionally installed assures it’s done properly and safely. Also, professional installation is a safeguard against warranty issues should the ladder fail due to a defect. Read the instructions. 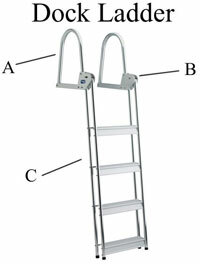 Mounting and assembly instructions are included with your boat ladder. If you intend to install the ladder yourself, read and follow the instructions so the ladder is installed properly and won't fail you down the road. Cutting and drilling will be required. Depending on where the ladder is mounted, you will have to drill into your deck or hull. Pre-drilled holes on the ladder may also need a little extra drilling in order to allow the bolts to fit properly. Additionally, ladder tubes may need to be cut down to match the curve of your hull. Install a backing plate for additional support. When someone is climbing your boat ladder, a large amount of stress is being exerted over a small area of the hull. This can cause the hull to buckle or the screws to loosen. A metal backing plate helps mitigate such issues by reinforcing the hull where the ladder is mounted. Measure the area and position your ladder before drilling. Since each mounting situation is different, measure your intended mounting area, position your ladder, and mark where you are going to drill ahead of time. Make sure everything is positioned correctly and as you want it before drilling any holes. Safety Tip: Periodically check the mounting and assembly hardware and retighten as necessary. Vibration from the motor and regular use may cause hardware to loosen over time. One of the most common questions asked when selecting a boat boarding ladder is whether or not the mounting hardware is included. The answer depends on the manufacturer and the ladder. In most cases, assembly hardware and special mounting brackets (if required) are included. However, it is common to have to go to a marine supply store and purchase the actual hardware needed to physically mount the ladder to your boat. This mounting hardware should only be a couple of nuts, bolts, and washer sets. Every boat is unique, and so are your ladder-mounting needs. Are you mounting to the transom? Is it a flat or curved transom? Are you using backing? All of these considerations, and more, help determine the size and type of hardware you’ll need. 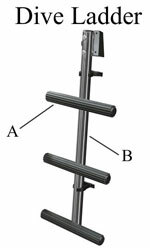 Because of the many factors and variations among boats and boat ladders, there is not really a “one-kit-fits-all” mounting solution. Replacing a mounted boat ladder is a tricky scenario. In an ideal world, you can find either the same model or one with an identical mounting pattern and use the same holes. If you know the brand and model number of the ladder being replaced, these factors will help your sales representative determine if a new ladder is available. However, if the ladder is more than 10 years old, chances are that model is no longer available. You may be able to find a comparable mounting pattern from the same brand, but the more likely scenario is you'll have to patch the mounting holes in your boat, replace the backer plate (or add one), and then remount using the new boat ladder. Though they are not immune to it, both aluminum and stainless steel boat ladders are designed to resist corrosion. Salty marine air, submersion in water, and marine life can eventually cause rust, but regular ladder cleaning and maintenance can help maintain your ladder’s luster and rung life for years to come. To care for your boat ladder, regularly implement the following steps. Rinse the ladder after use. After you're done on the lake for the day give your ladder a quick rinse with the hose to remove any corrosive elements. Regularly clean your ladder. Just like cleaning your car or washing your favorite boat, periodically cleaning your boat ladder with soap or a mild abrasive will reduce the risk of corrosion. Stow the ladder out of water when not in use. When you're done boating for the season, remove the ladder and store it in a dry place out of the elements.